NetWorks is highly efficient and very fast. 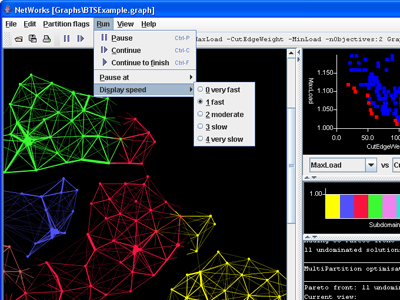 In the example on the left, a randomised test case with around 1,000 vertices, generated to have similar features to real mobile phone networks, the software can compute, display and evaluate 500 solutions in just over a minute (on a laptop with a 2GHz Pentium CPU). Even for large networks the software is very fast and the runtime scales approximately linearly with problem size. 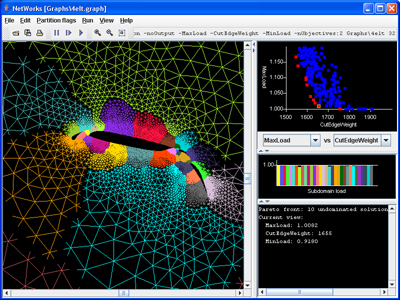 In the example on the right (with 15,000 vertices), the software can compute and evaluate each solution in under two seconds (giving a run-time of around 15 minutes for 500 solutions). The first example graph shown on this page is a randomised test case, generated to have similar features to a real mobile phone network. The second is extracted from a finite element mesh and is not meant to represent a real mobile phone network.